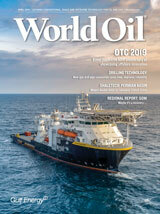 Thank you for considering World Oil for your 2019 marketing and advertising needs. For more than 100 years, World Oil has been THE essential source of technology and trends information for more than 47,000 executives, engineers, and other industry professionals in the global upstream, onshore and offshore oil and gas industry. Included in this year’s media planner, you will find a wide variety of print and online opportunities, focusing on both brand awareness and lead generation. Used together, marketing plans can be customized to allow your messaging to reach the key decision-makers in the upstream oil and gas industry, and allow you to show ROI through qualified lead reports and analysis. We pride ourselves on helping our clients meet their objectives of yielding qualified branding, lead reports and analysis, thereby strengthening their marketing ROI. Additionally, clients benefit from the strength of our dedicated and esteemed editorial team, who have decades of combined experience, and who are committed to producing the finest technical publication in the industry, month after month, year after year. Bottom line: our commitment is to you—our clients! We look forward to assisting your company with a successful, integrated marketing strategy with World Oil this year, to not only meet, but exceed, your objectives for 2019. We appreciate the opportunity to work with you and thank you in advance for your business.